Blake Griffin is an advertiser's dream. He combines a freakish athletic ability with a charismatic personality and tops that off by playing in a huge market as a member of the Los Angeles Clippers. Although his high-flying act immediately caught the attention of fans, Griffin developed a reputation as a one-trick pony. However, after several years in the league, his game is evolving and Blake Griffin rookie cards are once again primed for a big boost. 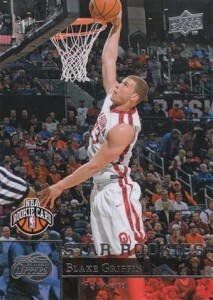 Shop for Blake Griffin rookie cards on eBay. The Clippers have long toiled in the NBA doghouse, but they are no longer just the "other" team in Los Angeles, as Griffin, Chris Paul and Doc Rivers have the team pushing for an NBA title. The team will need a dominant postseason from Blake Griffin in order to stake their claim as the best of the NBA. If he can take the team and his game to the next level, Blake Griffin cards will approach an elite group in the collecting world. 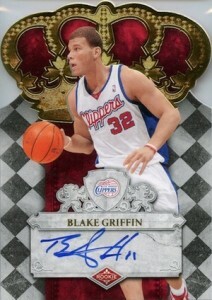 With nearly 30 total rookie cards, Blake Griffin collectors have plenty of options. The list below features ten of the best Blake Griffin cards, going from the low-end all the way to the ultra premium price range. 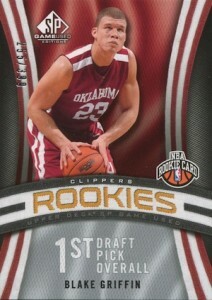 View a complete checklist for all Blake Griffin rookie cards here. 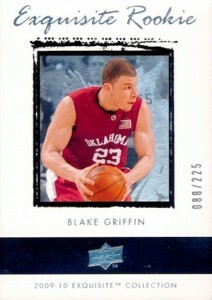 If you are looking for a nice and inexpensive rookie for Blake Griffin, look no further than his base card in 2009-10 Upper Deck. The card captures the moment just before one of his trademark dunks. Some collectors may not care for the college image, but the value is slightly boosted by tougher short print odds. The First Edition card looks very similar but is number 177. It may not convey the high-end nature of the product, but this numbered rookie card from SP Game Used is one of the top base Blake Griffin rookie cards available. A print run of 399 keeps it relatively rare, but not so much that it is impossible to find. 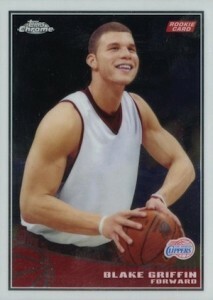 Looking at the card, it is does not jump out as a licensed card, but despite the airbrushed jersey, this is a very popular Blake Griffin rookie card. Issued as inserts in the base 2009-10 Topps product, each Chrome card is numbered to 999. Refractor (#/500) and Gold Refractor (#/50) parallels command the highest values. With the highest print run of any autographed Blake Griffin rookie card, Panini Court Kings also offers a unique art-like look. The sticker is not ideal, but is relatively subtle, and the card is among the most inexpensive signed rookie cards for Blake Griffin. Despite including a sticker autograph, Absolute Memorabilia also features a trio of relics. Aesthetically, the card feels cluttered, but this has not deterred collectors. The first of several on-card signatures, Classics achieves, well, a classic result, with a simple layout and solid design. 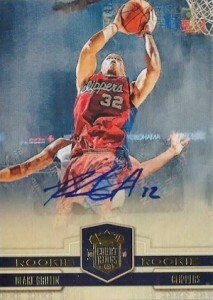 This Blake Griffin rookie card also brings collectors one of the most dynamic action images. 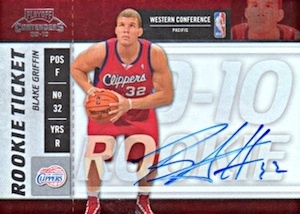 The horizontal layout of Blake Griffin's Contenders rookie card immediately helps separate it from the group. The oversized on-card autograph gives it a nice boost and although the card is not numbered, it was revealed to be a short print, limited to 649 or less. While it is certainly not the most valuable Blake Griffin rookie card, his Crown Royale rookie might be the most eye-catching. Gold foil, die-cut crown and a checkered background all come together with an on-card signature to make this bold card. 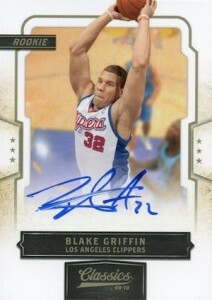 As a Panini exclusive, Blake Griffin could not sign his Exquisite Collection rookie cards. 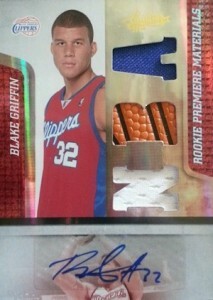 Despite this, his rare rookie still produces big sales and is the clear number two choice for Blake Griffin collectors. Few brands can even come close to touching the values of National Treasures. 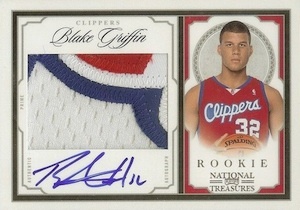 During his ROY season in 2010-11, Griffin's National Treasures cards went crazy. If Blake Griffin can turn his regular season success into postseason glory, the sky is the limit. 2011-12 LIMITED TROPHY CASE BLAKE GRIFFIN AUTO 2 COLOR PATCH 06 15 BGS 9.5 10! Blake Griffin 2014-15 Panini Eminence Silver Auto Autograph 4 10 Gold Ink HOT!